Yesterday Ubuntu released version 6.06 of their GNU/Linux distribution, codenamed Dapper Drake. Several parties were organized around the world to celebrate the event. The goal is to install, support, and advocate Ubuntu within your community, meet fellow Ubuntu users, and generally have a good time. 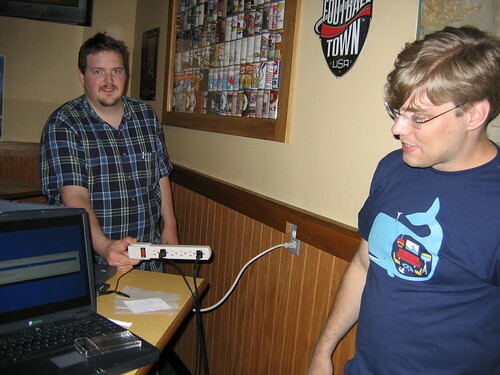 I organized a party on behalf of FreeGeek Columbus. 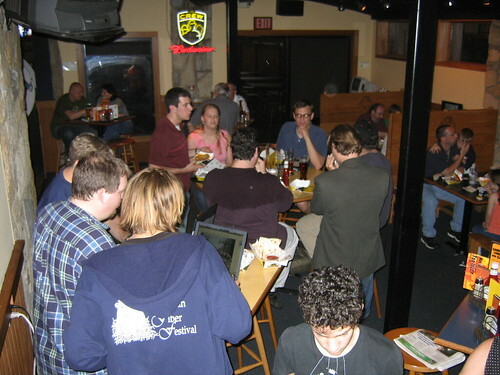 Most of the regular FreeGeek crowd showed up, and we had an enjoyable evening of food, drinks, and geekery. Robb and his friend Ray brought along a video camera for an indie media outfit. They recorded footage of the event and conducted some impromptu interviews. When the segment is edited and available, I’ll post links. One new face at the crowd was a local high school student named Paul. He dragged his mom with him to the event. I had a nice long chat with her, explaining the Free Software movement generally, Ubuntu’s business model in particular, and finally explaining how FreeGeek Columbus does its thing. It turns out she was involved with the original development of the Ohio Community Computing Network, an organization with whom we’ve been trying to partner! Serendipity strikes again. She quickly grasped the value and importance of what I was advocating. I found it remarkably funny that Mike brought with him a surge protector, but it turned out to have been a pretty good decision: a powerful thunderstorm rolled through town, and caused all of the lights in BW3 to dim substantially. All in all, we had a great time. I handed out half a dozen CDs and a couple DVDs to those in attendence, and I left behind a small handful of CDs for people to discover after we left. In hindsight, I probably should have left with the CDs some sort of description or marketing material so that people would know what the CDs were. Oh well. If there’s a release party in your neighborhood, make an effort to attend! 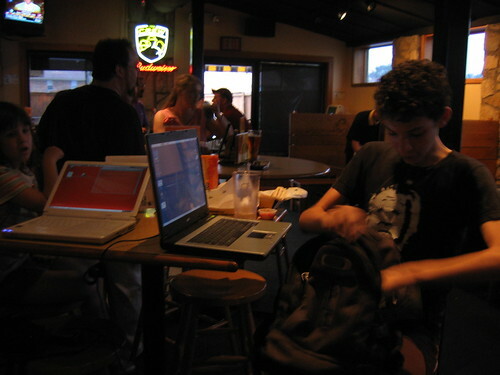 Introduce yourself, meet some new people, and become part of the Free Software movement! Track the Ubuntu and DapperReleaseParty tags to see photos from other celebrations around the world!